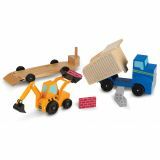 Get constructive play rolling with this 8 piece heavy duty wooden set that includes a dump truck, flatbed trailer and front and backhoe loader! 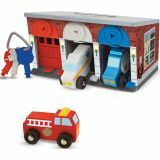 Encourage imaginative play with this sturdy set with realistic working parts. 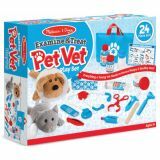 Give young animal lovers everything they need to examine and treat pretend pets! 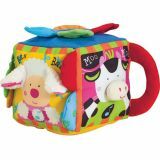 The 24-piece collection includes a plush dog and cat and all the accessories to examine and treat them. Store everything in a handy tote bag for house calls! Three rescue vehicles are ready to roll into action! 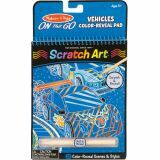 Just unlocked the doors with the color coded keys and press the buttons to release the ramp to send the vehicles racing to the rescue. Store the pieces and carry off the whole set when their mission is complete! An official white lab coat with a reusable name tag for little lab techs to perform the six included illustrated experiments! 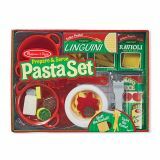 Set includes goggles, non-breakable beaker, test tube, petri dish, measuring spoons and a hypothesis card. 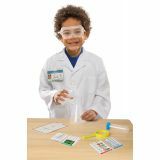 Detailed information on the scientific method make this a role play set fun and educational! Ages 5-8 years. 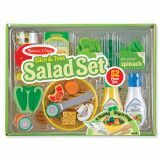 This colorful play-food set will have kids ready for holiday entertaining! 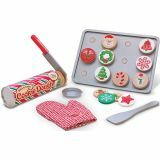 Slice and “bake” a dozen wooden cookies, then decorate them with festive toppings. An oven mitt, wooden cookie sheet, knife and spatula are included. 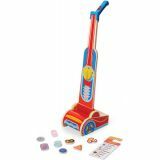 Housekeeping tools sized just for kids and built to last! 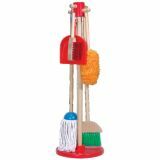 Hang the broom, mop, duster, dust pan and hand brush on the stand for neat, compact storage.